􏰀 Acknowledge the source of data, funding etc. Of all the planets in the solar system, Mars has sparked the greatest human interest as the conditions in Mars are believed to be hospitable since the planet is similar to Earth in many ways. Mars has surface features reminiscent of both the impact craters of the Moon and volcanoes, deserts and polar ice of Earth. Mars and Earth have almost equal period of revolution around its axis. Mars takes 24 hours and 37 minutes to complete one revolution around its axis. While Earth takes approximately 365 days to orbit around the Sun, Mars takes 687 days for the same. The gravity of Mars is roughly one- third of Earth’s gravity and it has a thin atmosphere with a pressure of 1 % that of Earth. The Indian Mission to Mars is primarily intended to establish Indian technological capability to reach the Mars, orbit around it and also provide an excellent opportunity, to the scientific community, to further understand the conditions at Mars. Mars Orbiter Mission is ISRO’s first interplanetary mission and is orbiting around Mars in an elliptical orbit of about 343 km x 71191 km as on 16th September 2016.Mars Orbiter Mission (MOM) is a complex technological mission considering the critical mission operations and stringent requirements on propulsion, communications and other bus systems of the spacecraft. Manoeuvre, reach Mars (Martian Transfer Trajectory) with the least amount of fuel, Mars Orbit Insertion and then to orbit around Mars. It has been configured to undertake limited scientific studies during the orbital life of the spacecraft, using the five Indian scientific instruments on board to study the Mars surface and its atmosphere. The country witnessed with pride, when India's first interplanetary spacecraft “Mars Orbiter” was successfully launched on November 05, 2013 at 2:38 pm by India's Polar Satellite Launch Vehicle PSLV-C25 from Satish Dhawan Space Centre. Mars Orbiter was precisely injected into an elliptical earth orbit (with a perigee of 248.4 km and an apogee of 23,550 km, inclined at an angle of 19.27 deg to the equator). Subsequent to the six orbit-raising manoeuvres, crucial the Tran-Mars Injection Manoeuvre was precisely executed on December 1, 2013 and the Spacecraft was placed on course to the Red Planet along a helio-centric path of 680 million km. MOM carries a suite of five scientific payloads with a total mass of about 14 kg. Mars Colour Camera (MCC) - This tricolour camera gives images and information about the surface features and composition of Martian surface. Methane Sensor for Mars (MSM) - MSM is designed to measure Methane (CH4) in the Martian atmosphere. Thermal Infra-Red Imaging Spectrometer (TIS) - Can be operated during both day and night. Its primary objective is to measure the surface temperature of Mars. Mars Exospheric Neutral Composition Analyzer (MENCA) – Designed to analyze the neutral composition of particles in the range of 1–300 amu (atomic mass unit) with unit mass resolution. This instrument was realised by Space Physics Laboratory(SPL), VSSC, Thiruvanathapuram. Lyman-Alpha Photometer (LAP) - A photometer for measuring the relative abundance of Deuterium and Hydrogen from Lyman-alpha emissions in the upper atmosphere. This instrument was built by Laboratory for Electro-Optical Systems, (LEOS), Bangalore. After a 300 days journey in deep space, on September 24, 2014, India's Mars Orbiter Spacecraft successfully entered into an elliptical orbit around planet Mars by firing its 440 Newton Liquid Apogee Motor along with eight smaller liquid engines. With successful Mars Orbit Insertion, ISRO became the fourth space agency to successfully send a spacecraft to Mars orbit and India became the first country in the world to do so in its first attempt. May 27, 2015 to July 01, 2015; MOM was behind the Sun as viewed from the Earth and no communication was possible between MOM and Earth. Spacecraft survived in full autonomy mode for a period of 35 days. Mars Orbiter mission experienced a white out geometry between 18th May to 30th May 2016. MOM is built with full autonomy to take care of itself for such a long period. No commanding was carried out on the satellite during the white out period. Payload operations were suspended. The spacecraft came out of White out geometry successfully on the 30th May 2016 and has been normalized for regular operations. India’s Mars Orbiter Mission (MOM) has completed two years around Mars on September 24, 2016 and accomplished its planned mission objectives. At present MOM and all its scientific payloads are in good health and it continues to provide valuable data of Mars surface and its atmosphere. The increased duration of observation of Mars by five scientific payloads is enhancing the planetary science data and also enabling coverage of Mars in different seasons. The images of Mars captured by the Mars Colour Camera have been received and found to be of very good quality. The Mars Colour Camera has so far produced hundreds of images for various landforms of Martian surface indicating presence of aqueous activity on Mars in climatic history. MSM, TIS, LAP and MENCA has collected ample data sets. 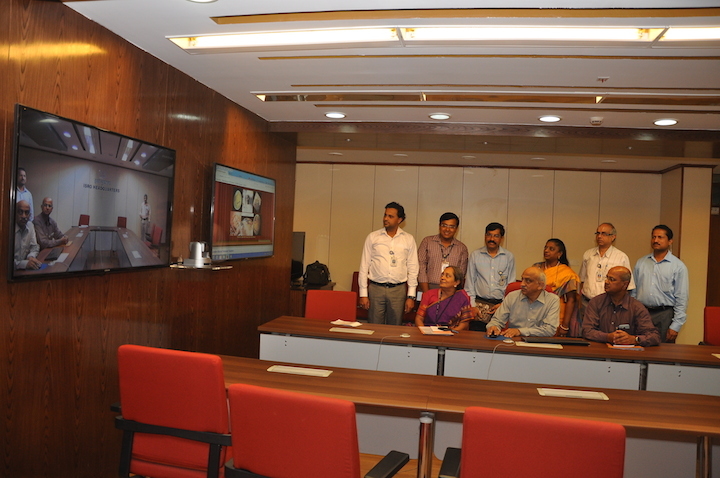 Data sets obtained from Mars insertion on 24th Sep,2014 to 23rd, September ,2015 is released to the public currently. MOM MCC data has helped us in understating the sublimation process on the Martian north pole, where CO2 & H2O ice cover changes significantly as Mars enters into northern hemisphere summer. The dust patterns around high altitude regions and in Valles were studied and mean height of dust layer was estimated to be ~1.5 km. Albedo using the 1.65 micron studies of the reference channel of Methane sensor for Mars (MSM) was also estimated. Joint morphological studies using MCC and the high resolution mineralogical data with the NASAs CRISM data has been carried out, which enables the identification of different minerals like sulphates and ferrous based compounds on the surface of Mars. Imaging of the two Moons of Mars i.e. Phobos & Deimos by MOM has revealed new details about these moons of Mars. The near side of Deimos was imaged in feb,2016 the far side of Deimos. A collage of the images from MOM has been brought out as 'Mars Science Atlas' and is available at http://www.isro.gov.in/sites/default/files/article-files/pslv-c25-mars- orbiter-mission/celebrating-one-year-of-mars-orbiter-mission-orbit-release-of- mars/Mars-atlas-MOM.pdf for Students and Academic institutions. ISRO has launched MOM Announcement of Opportunity (AO) programs for researcher in the country to use the MOM data sets. First Mars mission in the world to succeed Mars Orbit Insertion in first attempt. First Indian spacecraft to escape the Sphere of Influence of Earth and orbit Sun. Most economical interplanetary mission in the world and paved way for cost-effective access to deep space. Indian Space Research Organization (ISRO) - Mars Orbiter Mission (MOM) team won the US based National Space Society’s” Space Pioneer Award” for science and engineering category for the year 2015. The Indira Gandhi Prize for Peace, Disarmament and Development is awarded to ISRO in recognition of its path-breaking achievement, culminating in Mars Orbiter Mission, its significant contribution in strengthening international cooperation in peaceful use of outer space. ISSDC is the primary data center for the payload data archives of Indian Space Science Missions. This data center is responsible for the Ingest, Archive, and Dissemination of the payload data and related ancillary data for Space Science missions like MOM. The primary users of this facility will be the principal investigators of the science payloads. In addition to them, the data will be made accessible to scientists from other institutions and also to the general public. Payload data from the spacecraft is received at the data reception stations during its visibility periods for the satellite where it is logged for subsequent transfer to ISSDC. The underlying standard of the ISDA is the Planetary Data System (PDS) is the default data archival standard practiced by all space agencies in planetary missions. PDS advocates for elaborate ASCII metadata. The MOM archive will contain spacecraft data and instrument data, as well as derived or merged instrument data (wherever applicable). The MOM data sets are disseminated through an online archive, where the data are delivered electronically. A data set will include the instrument data as well as the ancillary data, software and necessary documentation that support the use of these data products. In general, the data products from different instruments are contained in separate data sets. Data sets may include data products from one or separate data sets. Data sets received at ISSDC, Byalalu, processed there for active archive shared with PI team. In payload operation centres at SAC, SPL-VSSC and LEOS further processing, analysis is carried out for science output and outreach purposes. Mars acquired data sets have been archived in long term archive PDS standards meant for planetary observations. Long term Archive data sets belonging to Sep, 2014 to Sep, 2015 is released for Announce opportunity collaborators and public. Rest of the data sets will be released at every six-month schedule as per best practices in the planetary data system. Fig-2. MCC moderate resolution coverages Here we have excluded MCC full disc images. North pole has been already covered. Only south pole is left for coverage. LAP and MENCA coverages are not shown over Mars map, as they collect data over Mars exo atmosphere. ISRO Science Archive (ISDA) LTA currently holds data sets acquired during Mars Orbital Phase from 24-Sep-2014 to 23-Sep-2015 from all the five instruments namely MCC, TIS, MSM, LAP and MENCA. This release has Level-0 (CODMAC-2) and Level-1 (CODMAC-3) basic data sets prepared using Planetary Data System (PDS) version 3 standards. Multiple data releases will cover different mission durations, experiments, and observations. Data Clarifications will be provided by PI and Data Processing Teams on mission, experiment, Processing and science analysis aspects of these data sets, in addition to documents placed in archive. Acknowledge the source of data, funding etc. Researchers and common public who is downloading the Mars Orbiter Mission data sets, are required to acknowledge the ISRO for data, funding (if granted) and the research writeups taken from the archive. "We acknowledge the use of data from the Mars Orbiter Mission (MOM), first inter- planetary mission of the Indian Space Research Organisation (ISRO), archived at the Indian Space Science Data Centre (ISSDC)"
"The research is based partially / to a significant extent (whichever is applicable) on the results obtained from the Mars Orbiter Mission (MOM), first inter-planetary mission of the Indian Space Research Organisation (ISRO), archived at the Indian Space Science Data Centre (ISSDC)"